You are here: Home / Fun / In What Order Should I Watch Dreamworks Dragons? My girls have spent the past month watching, (and rewatching) the Netflix exclusive How to Train Your Dragon series, Dragons: Race to the Edge. Knowing that the new movie is hitting theatres on Feb.22nd has fueled a renewed obsession with all things Dreamworks Dragons in our household. With the release of How to Train Your Dragon: The Hidden World, now is definitely a great time to catch up on watching (or rewatching) all of the various films and TV episodes. But with three How to Train Your Dragon movies, and, if you count the Netflix series, three different TV shows, plus numerous short films… How do you figure out the chronology, the How to Train Your Dragon timeline, and the correct order to watch all of the various shows in? Disclosure: I am a member of the Netflix #StreamTeam, and as such, I am compensated to provide thoughts and suggestions about what’s currently showing on Netflix. As always my words and opinions are my own. Also, note that some of the links in this post are Amazon Affiliate links. As an associate, I earn from qualifying purchases. I have to admit, when my kids first started watching Race to the Edge, I wasn’t paying much attention. I watched a bit, here and there, basically just checking to ensure it was a series I felt comfortable with them seeing, and then I pretty much ignored it. At that point, I hadn’t even seen the film that launched this spin-off series. The girls had watched How to Train Your Dragon with their dad one afternoon when I was busy doing other things. However, over time their obsession level ramped up (at least in part because Grace became really wrapped up in working on her own Book of Dragons). When my kids start asking to watch the same show every day, I sit up and pay attention. That combined with the fact that I am often in the room with them when they are watching TV, has led to me getting drawn further and further into the dragon riders of Berk, and to be honest, getting sucked into the setting and storylines. This, of course, made me want to watch the movies, and as I started poking around I came to the realisation that there was a heck of a lot more Dreamworks Dragons stuff out there that we had yet to see (in total there are three movies, two older television shows, a handful of short films, plus the Netflix exclusive series). But out of that what was available to watch on Netflix? Where could I find the other shows? What order should we watch them in? I mean my kids don’t really care and will watch things in any old order, but I was curious to know what the chronology of the ongoing story was. So I did some research and this is what I came up with. First, of course, is the film that started it all: How to Train Your Dragon. This is easy to find, just about anywhere. Watch it on Netflix, grab a DVD, whatever works for you. Just go watch it, right away. Don’t wait six years, like I did. Next up is a handful of short films; Gift of the Night Fury, Legend of the Boneknapper Dragon, and Book of Dragons. You can find all of these on Netflix, and I recommend streaming them there versus trying to hunt down the DVD versions, which can be pricey. The short films can be difficult to locate on Netflix. For example, Book of Dragons and Legend of the Boneknapper Dragon can be found bundled together under the title How to Train Your Dragon Legends. Gift of the Night Fury is a little trickier, looking for it in the Netflix search bar won’t net you any results, but you can find it hidden within Dreamworks Holiday Classic (Episode 3). After that come two seasons worth of Dreamworks Dragons television episodes. These originally aired on the Cartoon Network, and are currently available on DVD. The first season was called Dragons: Riders of Berk. 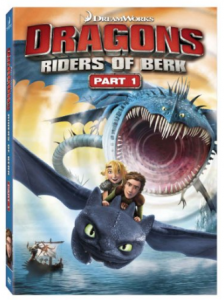 You can find it on DVD packaged as Dragons: Riders of Berk Part 1 and Dragons: Riders of Berk Part 2. The second season was called Dragons: Defenders of Berk. You can find it on DVD packaged as Dragons: Defenders of Berk Part 1 and Dragons: Defenders of Berk Part 2. Next up is another short film called Dawn of the Dragon Racers, which is currently streaming on Netflix. Following that is the Netflix exclusive series Dragons: Race to the Edge. There are six seasons of Race to the Edge available (And yes, unfortunately, it’s been confirmed that the sixth season is the final). And lastly you have the newst film, How to Train Your Dragon: The Hidden World, which is just coming out in theatres as of February 2019. I also feel like I should mention, the entire franchise is based on the series of How to Train Your Dragon books written by Cressida Cowell. They are a fun read. Check them out. How to Train Your Dragon (2010) – Currently on Netflix. Gift of the Night Fury (2011) – Currently on Netflix, sort of hidden under Dreamworks Holiday Classics, Episode 3. Legend of the Boneknapper Dragon (2010) – Currently on Netflix under How to Train Your Dragon: Legends. Book of Dragons (2011) – Currently on Netflix under How to Train Your Dragon: Legends. Dragons: Riders of Berk (2012–13) – Not on Netflix, is available to purchase on DVD as Dragons: Riders of Berk Part 1 and Dragons: Riders of Berk Part 2. Dragons: Defenders of Berk (2013–14) – Not on Netflix, is available to purchase on DVD as Dragons: Defenders of Berk Part 1 and Dragons: Defenders of Berk Part 2. Dragons: Dawn of the Dragon Racers (2014) – Currently on Netflix. 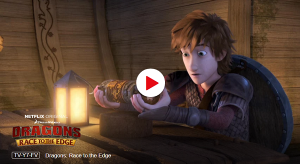 Dragons: Race to the Edge, Season 1-6 – Exclusively available on Netflix. 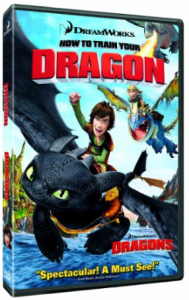 How to Train Your Dragon 2 (2014) – Not currently on Netflix, is available to purchase on DVD. How to Train Your Dragon: The Hidden World (aka How to Train Your Dragon 3)(2019) – In theatres as of February 22, 2019! 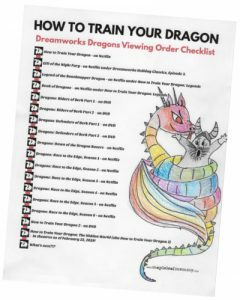 If you (or your kids) are into Dreamworks Dragons you may also be interested in creating your own book of dragons, check out this great list of free online resources for making your own dragon rider’s notebook. Click here to get a printable version of this checklist. I don’t think that they have seen any of these. I’ll have to check them out. Just binged Dragons: Race to the Edge. It answers a lot a questions that I had about How to Train your Dragon 2. I won’t spoil it for you but they were great. We dont have Netflix so I didnt know there is more How To Train Your Dragon!! My kids and even me loved that movie!! well now I know what we’re watching this evening! thanks for the inspiration! Thank you SO much for your quick and easy guide on how to watch how to train your dragon. We were completely lost! We started watching one episode from Dragons: Race to the Edge and realized there were new characters, enemies and quarrels so I looked for some guidance on the net and found yours! SO happy for that!! Thank you very much. I love how to train your dragon 1 + 2 and a friend of mine told me there is more, because her son loves it in german. I prefer english to improve mine. So you guided me what I really want to buy. It should be noted that there is also a HTTYD comic book called “The Serpent’s Heir,” which takes place right after How To Train Your Dragon 2. The book is available through your local library, and is well worth a read. I’ll have to take a look for that one. Thanks, Christopher! Oh, boo. Too bad about the third moving being pushed back. Still, something to look forward to. We’ve only watched the two main movies and loved it, but we have yet to dive into the Netflix ones… Thanks for the checklist though! Wow, I did not know how many mini films and movies this franchise has. This is a handy list! My daughter is obsessed, and honestly, I really love watching with her! I have been trying to figure out what more to watch and this post is perfect! But question, we don’t have Netflix. Is the ONLY way to watch Race to the Edge through purchasing Netflix? I guess I assumed earlier seasons would be on DVD, but it doesn’t look like it. Thank you! Race to the Edge is a Netflix exclusive show, it was produced by Dreamworks specifically to air on Netflix. Race to the Edge is not available on DVD. I can’t think of any other Netflix exclusive kids shows that have made their way to DVD, so I am guessing that Race to the Edge will not be hitting DVD anytime soon. I really have to start watching these. I’ve heard so much about them. I have seen every thing How To Train Your Dragon. I almost have all the movies all I need is the gift of the nighfurry and I have seen it. I have Rideres and Defenders of been part 1 and 2 for both of them i have seen all the episodes on Dragons Race To Dragons Edge 20 times every episod and yes I have kept track and I have been tracking the 3rd movies release date since the 2nd movie came out. I would say that I’m a little bit obsessed with it. Where in the world are you located, Virgil? Is it possible that season 5 and 6 has yet to premiere in your country? I’m located in Canada and I can view all six seasons (and I believe the same can be said for the United States). I search netflix but i cant find race to the egde, there is a different name? It’s listed under “Dragons: Race to the Edge”, Netflix Original series. I just double checked and it’s still there (whew), all six season. I am in Canada and am using Canadian Netflix. If you are elsewhere in the world your version of Netflix may be different. My daughter wants to have a birthday party with this theme. Any suggestions? 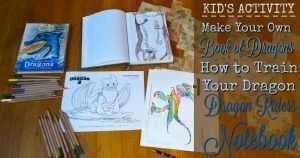 Have you seen the other Dragon Rider’s post I created, the one about how to create a book of dragons? If you hit the dollar store and buy some inexpensive blank books, that might be a cool party activity. If you look at that post I have a list of over 20 different links to where you can print out pictures of dragons to copy (or to colour and cut out). As well, while I was poking around looking for good resources for that post, I happened to notice that the official DreamWorks How to Train Your Dragon site also has a bunch of cool print and fold paper crafts, and even some party specific ideas. S 3D papercraft version of Toothless might make a pretty cool centrepiece for a table of snacks, or be a neat take-home activity for older kids. I’ve been a fan since the first film came out, but until this year (when someone convinced me to get Netflix) I have been unable to watch the series (except sporadically when with friends who have cable or Netflix). All the series are well designed artistically, nicely animated (remember TV animation is necessarily not as awesome as movie animation due to shorter time and budget). The stories are well written, the characters well developed and while it’s a cartoon and things are exaggerated in that genre, they are grounded in real character, relationships, and the kinds of challenges kids will face as they grow. You said it perfectly, Teanna. The animation really is decent for an episodic show, the stories are well written with fully realized characters. It’s a topnotch show. I was sorry to see it come to an end. My family is eagerly awaiting the film (and fingers crossed that Dreamworks rolls with another episodic series after the movie). And yes, who the heck wouldn’t want their own dragon?!? I just wanted to say that my husband and I are obsessed with the How to Train Your Dragon’s universe! We don’t have any kids but we watch the movies obsessively and are on our second time through race to the edge. Just bought the other two shows on google play movies and are going to be starting them tonight. SO EXCITED! Thank you! I would never have found Gift of the Nightfury on Netflix streaming without you! For those of us who still have Netflix DVD service, all of Riders of Berk and the first half of Defenders of Berk are available through it. I also successfully requested that my local library buy the second half. Good catch on the DVD service, Luke. I’m in Canada and Netflix doesn’t offer DVDs here, so I would never have discovered that on my own. Oh weird, I was (re)watching parts of Season 6 earlier today and it was working fine for me. Try writing their customer support maybe?